W. Soule provides the integration of custom sheet metal fabrication, piping, millwright work, HVAC/R service and ASME code work to our industrial and commercial clients. Thomas R. Soule founded T.R. Soule & Son in 1946 as a small residential plumbing contractor based out of his home in Paw Paw, Michigan. 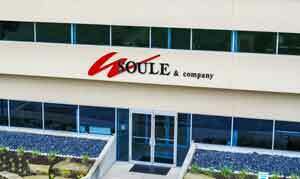 Over the next two decades the company grew and in 1966 Warren Soule, Thomas’ son, incorporated the company and renamed it W. Soule & Co. In 1980, Warren’s son John Soule took over management of the company and in 2015 long-time employee Gary Cline became majority owner and Brett Walters assumes Vice President duties of the growing company. The values haven’t changed – treat your employees and customers well. Now, more than 70 years later, W. Soule is a full-service custom fabricator and industrial mechanical company with over 425 employees. The company offers a full range of services including industrial process & power piping, custom metal fabrication and installation, millwright services, and 24-hour HVAC mechanical service. We are a talented and dedicated group of craftsmen and professionals ever seeking to utilize new, tested and innovative ways to help customers achieve their goals. Our success can only be judged by that of our clients; it’s at the core of our mission and everything we do. W. Soule’s mission is to safely provide on-time, cost-effective, quality industrial products and services that help our customers achieve their goals.